You know the feeling, don’t you? You’ve worked hard to write your web page. You’ve translated features into benefits. You have a strong call to action. You checked for grammar and spelling mistakes. But when you read your draft copy, you feel it’s dragging on. It lacks energy. A spark is missing. What should you do? How can you invigorate your content? Adjectives are the trickiest instruments in your writing toolbox. Use too many adjectives and your content starts sagging. Use the wrong adjectives and your content becomes icky. But when you pick powerful adjectives, your content pops, sparkles, and inspires. 4 essential rules guide your choice of adjectives. Follow these rules to inject energy into your writing, and tempt readers to interact, sign up, and buy. Before discussing these 4 rules, let’s quickly define what we’re talking about. That crazy Dutch girl writes crappy content. The word girl is a noun. The words crazy and Dutch are adjectives because they describe the girl. The word content is also a noun, and crappy describes what the content is like, so it’s an adjective. Wearing her wooden clogs, she arrived at the cocktail party. Clogs are a noun, and wooden describes what the clogs are made of, so wooden is an adjective. A cocktail is a thing, but it’s used as an adjective here, because it describes the party (a noun). In this case, the word cocktail is used as adjective noun. Adjective nouns mostly follow the rules for adjectives. But seriously, do adjectives matter that much? Research suggests that adjectives can reduce the power of our messages. After analyzing 200,000 tweets with links Dan Zarella found that tweets with adverbs and verbs get more clicks than tweets with more nouns and adjectives. You can’t make general statements about adjectives. Some adjectives possess persuasive powers, while others are limp and crappy. Research into restaurant menus, for instance, suggested that descriptive menu labels like “Southwestern Tex-Mex salad,” “ye old potato bread,” and “buttery plump pasta” can increase sales by as much as 27%. Adjectives aren’t created equal. So, which adjectives should you pick to see your sales go up? Overindulgence in adjectives makes your copy verbose and cumbersome. Our bestselling Petunia Mix contains a wonderful blend of 20 different types of Petunia flowers. Get the weather-resistant, colorful blooms of Petunia Mix for a sensational, long-lasting display of dazzling colors. Our bestselling Petunia Mix contains 20 types of Petunia flowers. The flowers are weather-resistant, so you can enjoy their dazzling display of colors even after a rain shower. These Petunias flower from early June to late September. That sounds less sales-y and more credible, doesn’t it? 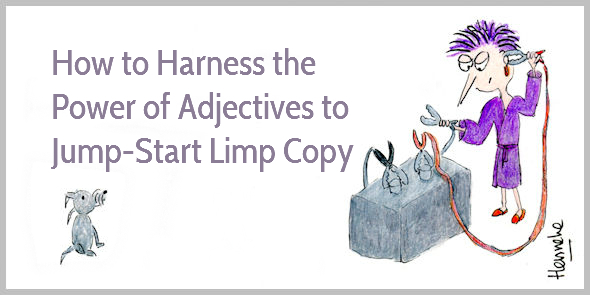 So, how can you cut cumbersome adjectives from your copy? If the meaning of your sentence doesn’t change when leaving out an adjective, skip it. Use a stronger noun if that means you can leave out an adjective. A crisis is better than a severe problem, a mansion or palace is better than a large house. Limit the number of adjectives before a noun, instead of a hot, humid, and sunny day try a sticky day. Print a copy of your content, and use a marker to highlight all adjectives. Now, review your adjectives one by one. If you can get your message across without using adjectives, leave them out. If you have more than one adjective before a noun, choose the most important one. We have assembled top-notch copywriting expertise, have a state-of-the-art training center, developed sophisticated teaching techniques, and called on innovative technology to ensure the highest level of tutor support. Any idea what’s good about that copywriting course? The copy is meh because most of the adjectives are hollow. Words like top-notch, state-of-the-art, sophisticated, innovative, and highest don’t give us a concrete impression of what’s good about the course. This course features 470 pages of copywriting instruction including persuasive techniques, tactics for writing faster, and 76 real-world examples. Short videos and transcripts help you absorb the learning. And each week you get feedback from experienced tutors. Note how each adjective is specific? These specific details add credibility to sales arguments. Review the adjectives you’ve highlighted before. Can you make them more specific? Can you paint a vivid picture of what your product or service means for clients? Adjectives that appeal to the senses add impact to your copy because they activate different areas of the brain. They make readers experience your copy as if they can feel, taste, or hear your words. Crunchy toffee and smooth dark chocolate. Treacly and savoury flavours. From the seamless transition of glass and metal to the streamlined profile, every detail was carefully considered to enhance your experience. Sensory adjectives can be visual (bright or drab), tactile (sticky or polished), or related to sound (fizzy or chirpy), taste (refreshing or bland), or smell (stale or fragrant). Review the adjectives you’ve highlighted in your copy. Can you replace any weak adjectives with sensory versions? Surprise startles the brain and grabs your reader’s attention. Shakespeare already used linguistic surprises. He used adjectives as verbs: Thick my blood—the adjective thick is used instead of the verb make thicker. Make up a new adjective or use a rare adjective to grab your reader’s attention. But be careful as new words can make your copy more complicated and reduce readability. Use in moderation only. Good copywriters follow strict rules of how to write. They stay on the safe side. They don’t want to upset the grammar police. But copywriting is only part science. The other part is art. So great copywriters know when to break the rules. They study copy. They read aloud. They hunt for fresh words, new rhythms, and irreverent styles of writing. They develop an ear for what works and what doesn’t. They experiment and play. That’s how they unlock their creativity, and turn limp text in persuasive content. So, go on. Follow the rules. And then try to break them. I like that you’ve mentioned the difference between hollow and persuasive adjectives. I’m guilty of this one myself. While using adjectives, I sometimes get so obsessed by them that I start using hollow ones that do nothing for my posts. I’ll make sure to replace them with persuasive ones now! What I really liked about today’s post is its consistency. You managed to sqeeze a lot of important points in a very “consumable” format. Another thing that helped to quickly understand your point were the action sections. As I was reading, I was wondering how I could improve these and then you had the solution. Also, the data on adjectives was fascinating. I didn’t know they were so important, even more than verbs, and how they could have such an impact on Twitter for example. Yes, those data are interesting, aren’t they? Fascinating how different research projects get different results. Shows us we have to be careful with drawing conclusions! In articles about architecture, it’s interesting to use auditory adjectives, because buildings have a sense of rhythm, too, and the sounds have an influence on our perception of architecture. Thank you Henneke. I’m itching to write today just to try out your tips. I love your blog. I learn something new with every post. I wish you posted every day but I know from experience that coming up with killer content that can actually help someone 7 days a week is not the easiest thing to do. Anyhow, looking forward to the next post! Glad you’re enjoying my articles! Wonderful editing tips. I plan to use several in my writing. Especially highlighting adjectives in my edit copy. And I liked the idea of playing around with adjectives to find the one that works. Thank you. Playing with words is an important part of editing for me. Have fun! Brilliant post, Henneke. Love the examples. I’ve updated my power-writing checklist with your nuggets. My single-page list has now rolled into two pages of suggestions to improve my writing. Thanks very much for this one. And if my clients only knew, they’d thank you, too! You’re welcome, Diane. Thank you for stopping by. Nice to “meet”! Seriously though, I’m going to give these steps a go on one of my next posts. It’s bound to be an eye-opener. Thanks Henneke for another informative post. Yes, adjectives can be like seasoning. Too many and they overwhelm. Too little and the dish is bland. I find it best to err on the side of too little, but that’s me. I really wish you had been my English Teacher at school. I made it to 49 without understanding what an adjective was. But seriously, this is a great post and you have sparked my imagination. Thank you. Glad to have sparked your imagination, Robin! Thanks Henneke. Je tips werken ook voor de Nederlandstalige blogger. En het inspireerde mij vandaag weer tot een nieuwe blog. Aantrekkelijke tekst bedenken over hetzelfde onderwerp is een bevalling elke 14 dagen. maar met zo een vroedvrouw als jij was het een “easy delivery”. Ik heb een https website en die kan ik blijkbaar hier niet invullen…? Thanks Henneke for the explanation. Always good to start my day with a TIP. Sun is shining in Holland! Spring is here. Adjectives exert too much weight on my consciousness when writing. I often view them as I would weeds on a lawn. Thank you for changing my perspective and giving me a way to think about them more constructively. Your techniques will lighten up my thinking and my writing. Adjectives really gives a sentence an added kick or boost to make it really pop. But what I know Iève done before it overload adjectives. Definitely something not to do again. I like rule 3 and have been writing more content that way, I just have to start incorporating the proper adjectives that heighten and delight the senses. Great tips. Yep, adjectives can feel overwhelming to readers, but when used with care, they can make your blog post pop! Glad you enjoyed this post, Andrew! Thanks Henneke for a great post. I love your sensory words use. It makes your copy irresistable. Thanks for the concrete examples! I love hunting for nice examples. I only came across the Firebox website recently. They have good copy (and some fascinating products, too!). great reminder,thank you. Certainly different to writing a book. I can now truly understand the difference. This email is a keeper. Thank you. Wow! Thank you and thanks again for this post!!! I loved every moment of it! Glad you enjoyed it, Lisa! Shakespeare. Yes. Let’s just learn from the best. These 4 tips helps out a lot. Sometimes i can overuse adjectives, and other times I don’t use them enough. So I want to be in the “just right” zone where I’m not over bearing but yet not dry. Thanks for sharing Henneke! Take Care! Yes, getting in the “just right” zone of adjectives helps master the art of great writing! Your tips are so helpful! I’ve saved this post to my google drive so I can get back to it asap when I’m rewriting. Definitely going to try the editing tips too. Great! Let me know how you get on? Is this guide to using adjectives applicable the same way to blog posts as it is with sales copy ? Hi Shaurya – yep, it applies to all business writing. What a brilliant article, which I’ll keep for future use. I’m confused about their use as I’ve read famous writers say you shouldn’t use adverbs, while other famous writers say they are wonderful.